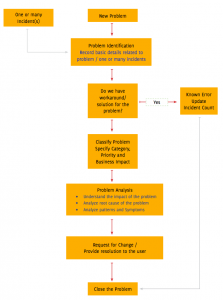 How to implement the basic ITIL processes? Home » IT & Tech Blogs » Information Technology » Planning » How to implement the basic ITIL processes? Nowadays implementing ITIL is necessary for any business, either it could be a small or medium business or a large enterprise. ITIL provides a set of proven industry standards that helps businesses to improve service delivery and customer satisfaction and reduced to IT costs. But a clear understanding of ITIL processes is essential for successful ITIL implementation. Here I am going to take you through few of the must have ITIL processes and steps involved. What is CI and it types? 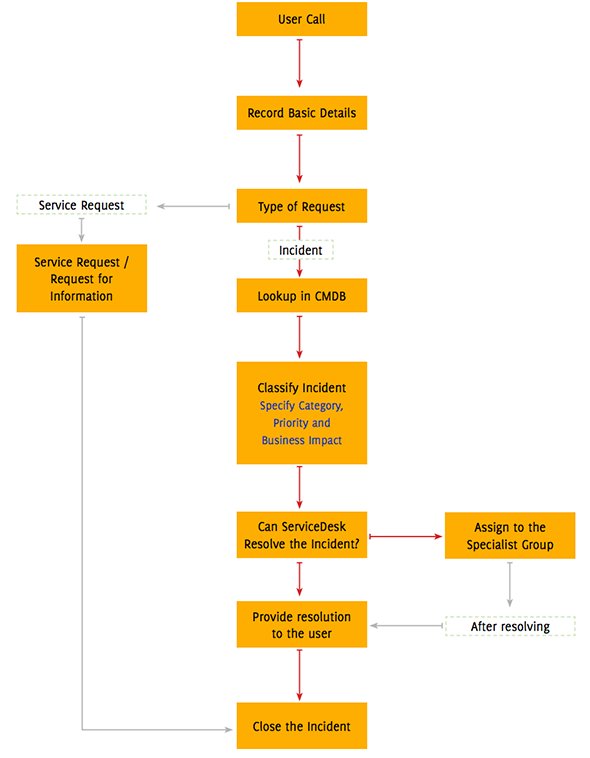 Incident management is the process, which allows you to find the solution for the incident in a timely manner. A service interruption or reduction of service quality might affect your business. The purpose of incident management is to restore your service as soon as possible, without affecting your business continuity. Integrated knowledge base can help your technicians to provide instant resolutions and also to keep up with the response and resolution time based on SLA (service level agreements). In some cases, the nature of an incident differs from organisation it could be a major incident or a minor one depending on the impact produced. Problem management is the process, which helps to reduce the business impact on service disruption and future disruptions. It helps to identify the root cause of the error in IT infrastructure, which is often referred as incident. The disruptions faced by the user can be different occurrences of a problem. When you are able to find the root cause for the incidents, you can also eliminate recurring incidents in future. When the user reports for a problem, the help desk technicians must check with the known error database. If the reported problem has a workaround or solution, it is a known error. 1. Proactive problem management – Proactive problem management’s focus is to eliminate the root cause before they have chances to appear. 2. Reactive problem management – Reactive problem management is based on responding to incidents after it occurs. Change management is a process of minimising risks involved with organisational, behavioural and structural changes into the IT environment. Adapting your business to any such changes is an overwhelming process and it may lead to service disruptions, if not proactively performed. Change management process is always recommended to start with a complete change implementation plan, right from submission, planning, implementation, post implementation review and closure. We can classify change into three types based on the impact and risk involved. Standard – These changes pose a very low risk on business and it is easy to prioritise and implement. 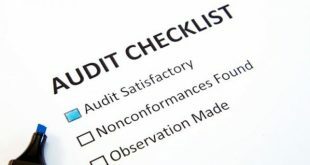 It follows a procedure or work instruction that doesn’t require approval in risk management perspective. Emergency – A change, which is to be implemented immediately to ensure business continuity. Every stage of the process demands getting approvals from change manager and change advisory board members, often referred as CAB. Normal – It involves a minimal risk, these changes must go through change process before being approved and implemented. The change advisory board will be deciding whether to be implemented or not. Release management aims to plan, design, build, configuration and implement changes smoothly. 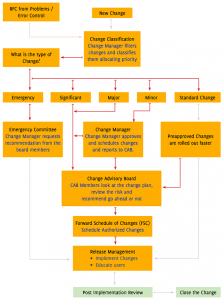 Change management works closely with the release management. 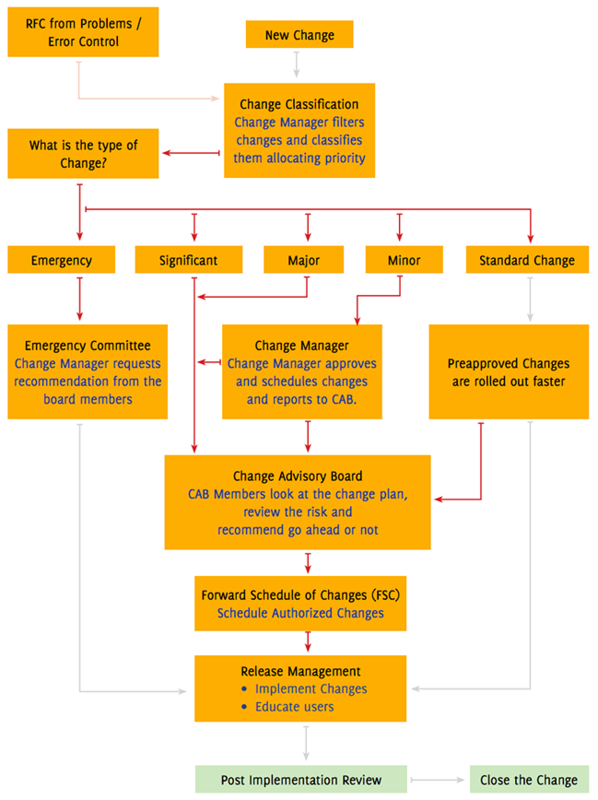 Change management is responsible for planning and release management is for execution or implementation. CMDB is a place that stores all information about the assets used in an organisation. The main goal of CMDB is to build an asset repository that can be uniquely identified and managed. With the CMDB feature, your business can gain full visibility on the infrastructure and services, which leads to take better decisions in IT environment. To manage your collections of IT assets, keep track on configuration items (CI). The configuration items can be hardware, software and network. CI is represented with attributes and relationship, which is to describe the objects. The attributes for CI type – Workstation could include model, service tag, IP address and so on. In other hand, relationship denotes the link between two CI’s that identifies the dependency or connection between them. Relationship map helps to visualize relationship between multiple CI’s. The CI impact on IT service can be analysed with the help of relationship map, and helps to find the root cause analysis. By analyzing the root cause and impact produced, we could eliminate the recurrence of issues faced by the organisation. Previous Read Here to Learn How You Can Perfect Your College Writing Skills.